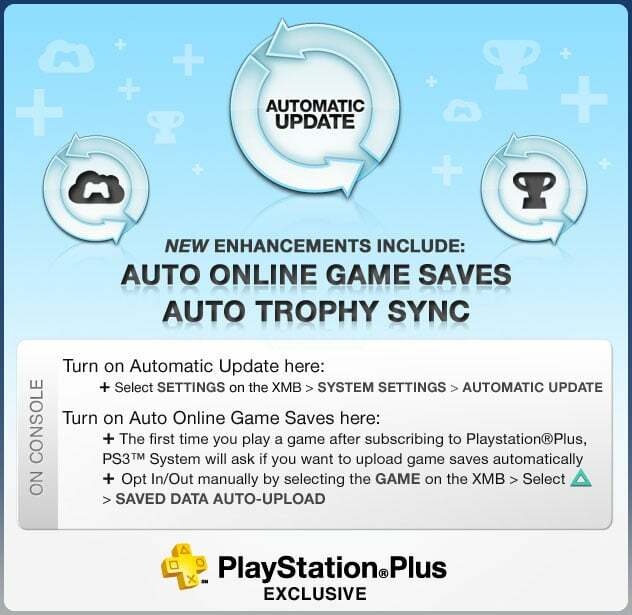 Sony upcoming firmware update for the PS3 will add auto syncing for trophies to your online profile. But don’t get too exited if you’re not a PlayStation Plus subscriber, this feature will be available for PlayStation Plus members only. Another feature they have added to PlayStation Plus member is to save your games data online. Now something for non PlayStation Plus subscriber was added as well, and that is a new recommendation feature that lets users recommend PlayStation Store content to friends. This features works by letting you send a link of a PlayStation Store Specific content to a friend. A new category called TV/Video Services that includes videos/movies applications like Netflix, Hulu PLUS, and VUDU has been added as well. Two updates for expanded capabilities for 3D Blu-ray movies has been added. No specific date has been mentioned, but the update is expected to come out soon, so stay tuned.